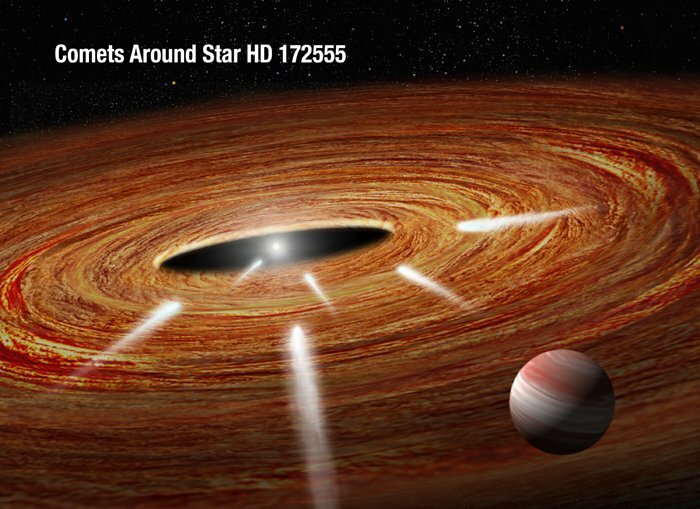 This artist’s impression shows several comets speeding across a vast protoplanetary disc of gas and dust and heading straight for the youthful, central star of the system. These "kamikaze" comets will eventually plunge into the star and vaporise. The comets are too small to be imaged, but their gaseous spectral "fingerprints" on the star's light were detected with the NASA/ESA Hubble Space Telescope. The gravitational influence of a suspected Jupiter-sized planet in the foreground may have catapulted the comets into the star.